Reps. Val Peterson, R-Orem; Mike Schultz, R-Hooper; Brad Wilson, R-Kaysville and Francis Gibson, R-Mapleton were elected as majority leadership by Utah House Republicans. Wilson will replae retiring Rep. Greg Hughes,R-Draper as House Speaker. Election season is barely over, but Utah lawmakers are already looking ahead to the 2019 legislative session with an eye toward addressing growth and infrastructure. Republicans in both chambers chose new majority leadership in closed-door elections Thursday night, including a new House Speaker and Senate President. Senate Democrats announced a change in leadership Friday morning. Rep. Brad Wilson, R-Kaysville, will replace Greg Hughes, R-Draper, as House Speaker. In the Senate, Stuart Adams, R-Layton, will take over from Wayne Niederhauser, R-Sandy, as president. The two leaders-elect are real estate developers, as were there predecessors. The leadership change marks a shift in power from southern Salt Lake County, the area Hughes and Niederhauser represented, to Davis County, where Wilson and Adams live. In the House, Rep. Francis Gibson, R-Mapleton, will serve as the new majority leader while Rep. Mike Schultz, R-Hooper, was elected whip with Rep. Val Peterson, R-Orem, as assistant whip. 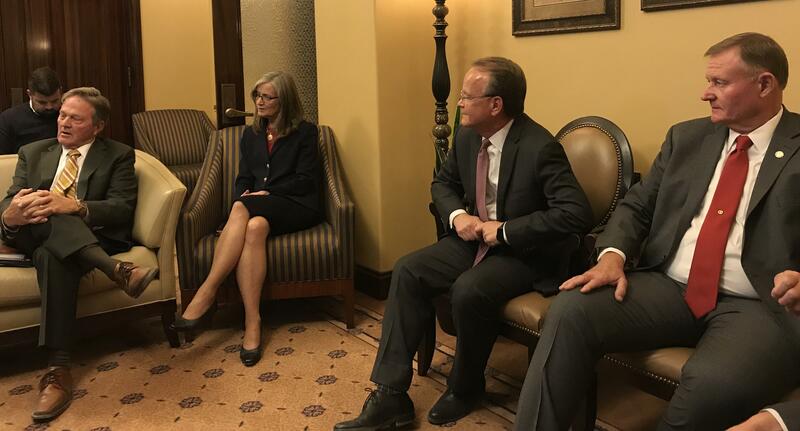 Senate Republicans chose Evan Vickers, R-Cedar City, as majority leader; Dan Hemmert, R-Orem, as whip; and Ann Millner, R-Ogden as assistant whip in their caucus. Sen. Jerry Stevenson, R-Layton, will continue his role as chairman of the powerful Executive Appropriations Committee. Sens. Jerry Stevenson, R- Layton; Ann Millner, R-Ogden; Stuart Adams, R-Layton and Evan Vickers, R-Cedar City. Leaders-elect in both chambers said planning for the state’s explosive population growth is a top legislative priority, including funding for education and infrastructure. "We obviously need to be thinking a lot about how the state’s growing," said Wilson. "Everything from infrastructure funding to water, transportation, our education system, air quality issues. Those are important." Wilson also cited the state’s housing affordability crisis as "a byproduct of rapid growth." Asked whether he would consider new taxes to boost education funding after voters rejected a ballot question along those lines, Wilson was blunt: "No." "My appetite for a tax increase is about as low as it could be," he said. "We will continue with our strategy of trying to grow the economy in a smart way and trying to find efficiencies in productivity in government — and use as much money as we possibly can to fund higher ed and public ed in a smart way." Incoming Senate President Stuart Adams pointed to efforts during the 2018 session to boost education funding, including a property tax cap that could contribute about $375 million over five years. "We’ve spent a lot of time trying to fund education … I think that’s going to be again our number one priority. We’ll keep it up," Adams said. The new majority leadership will begin their two-year terms on Jan. 1. Senate Democrats announced Friday morning that Sen. Karen Mayne, D-West Valley City, was elected minority leader. Sen. Luz Escamilla, D-Salt Lake City will serve as whip, with Sen. Jani Iwamoto, D-Holladay as assistant whip and newly-elected Derek Kitchen, D-Salt Lake City was chosen as caucus manager. With a few seats still in flux after Tuesday’s election, House Democrats will pick their caucus leadership later this month. "We are looking forward to working with our colleagues on both sides of the aisle and in both chambers to do the work the people of this state have elected us to do," Sen. Mayne said in a statement Friday. "Utah faces many challenges, and we owe it to the citizens of this state to come together to find solutions that will ensure a secure and prosperous future for all Utahns." Utah Democrats are cheering pickups in the Legislature that, while nowhere close to a majority, will pad their slim ranks. Senate President Wayne Niederhauser has announced his retirement from state government, joining a mass exodus of longtime lawmakers from the Utah Legislature. Utah House Speaker Greg Hughes opened the first day of the 2018 legislative session telling lawmakers to brace themselves for a fire-hose of tough issues, including taking on opioid makers.